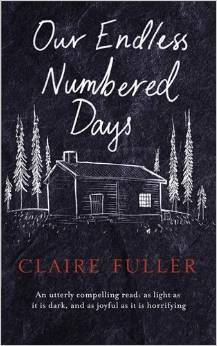 Five months today my debut novel, Our Endless Numbered Days will be published in the UK by Fig Tree / Penguin. And last week I held the real book in my hands (an advance copy) – an unbelievably exciting moment, and one, when I started writing I never really believed would happen. I began my novel in January 2012, and in the September of that year started keeping a writing diary, just a page every so often about what I was thinking and where I had got to. 8th September 2012: (43,412 words) Today I changed the title from The Great Divide to Our Endless Numbered Days. Seems to work, maybe. 14th October 2012: (50,871 words) I was pleased to hear that Morag [Morag Joss, an author and lecturer on my Creative Writing MA] finds writing incredibly painful, but she loves editing, which is the same for me. Once I have something down on paper I can see a million things that are wrong with it. 10th November 2012: (54871 words) To have it done [the first draft] by Christmas would be good and then it’s revising time. I have to be able to try and write like I’m doing NANOWRIMO, but I just don’t know what is going to come next – each word is painfully squeezed out and each one embarrasses me when it’s down in black and white. 17th November 2012: (55058 words) Procrastination. I have it bad. Cleaned the house, all of it, well nearly. Went on Twitter, only for 10 minutes which turned into an hour. And still I haven’t started writing. Soon it will be time for lunch. 28th December 2012: (70546 words). Removed all the crap from the end and finished first draft! (Well, actually it’s called draft 8). 29th December 2012 to end March 2013: (About 80,000 words) I spent these three months editing and polishing, but didn’t write any diary entries. And then when I can see an email has come in, my heart races even more. And then yesterday there was a response from an agent! Click. Rejection. Spent half an hour trying to work out if it was a standard rejection letter or not. Probably it was. 15th April 2013: Still obsessing about agents. Last week I got another rejection and then the next day a request for a full submission from Lutyens and Rubinstein. I was very pleased, very very pleased but decided I shouldn’t go on about it, because it might not go anywhere, so I shouldn’t tell anyone at all. Then I told Tim, and Paul, and India, and Mum and Heidi and Sarah and Emma. Oh dear. 25th April 2013 (6:34am): Today I go up to London to meet Jane Finigan from Lutyens and Rubinstein. Their reader read the full submission and passed it to Jane who read it and wants to meet me. I am so nervous and excited. I can’t quite believe that someone who isn’t my friend or my family likes what I’ve written. 27th April 2013: Two days ago Tim and I took the day off work and went to London, so I could meet Jane. On the train on the way up Tim practiced questions with me – how did this book come about; what was I reading at the moment; what would you say if I told you I thought this book was YA? ; How long have you been writing for? ; Who else did you submit to and what did they think? ; Are you planning another book and what’s it about? For an hour. We walked to Notting Hill. And I got quieter and quieter as I became more and more nervous. Tim was very patient; we sat in a café, but I could only drank water and visit the loo. We were still early, so we went into Books for Cooks where I opened several books but didn’t read the words, and just as I was wondering where I was going to find another toilet it was time for my meeting. The agency is in the basement of the Lutyens & Rubinstein bookshop, so after I had asked for Jane at the desk, I stood around opening random books looking at the print and not reading those either. I stroked a few covers instead. It is a very lovely bookshop. Jane took me for tea and bought me the smallest raspberry cake in London. I could have fitted four in my mouth at once. We did all that chatting stuff about my journey. And then we talked about the book, things she would want to work on, the L&R process, how I came to write it – ah, luckily I could answer that one. I didn’t tell her I had practiced my answers for an hour. She was surprisingly enthusiastic. She said she had needed to check I wasn’t a mad-cat-woman-author or someone who would throw tea in her face if she suggested revisions, and it seems I managed to convince her I wasn’t because half-way through the meeting she said she’d like me to sign with them. We went back to the agency where I was introduced as ‘Claire Fuller, an author’, which made me want to laugh. I didn’t. And then she walked me up the stairs back to the ground level of the bookshop. She said she would send across the contract that afternoon for me to have a look at. I went to shake her hand, but she moved forward and gave me a hug. She smelled very nice. Important in an agent. So, I went home on the train with Tim, already convinced I would sign with Lutyens and Rubinstein. And over the next two days it has been done. Click here to read the second part of my journey to publication: Edits with my agent and the auction. Our Endless Numbered Days went on to be published by Fig Tree / Penguin in the UK, Tin House in the US, House of Anansi in Canada, and many other publishers around the world. Find out more. I’m so, so thrilled for you, Claire … but on top of that, this was such an interesting (and reassuring) post to read. Glad I’m not the only one who needs the loo ten times before an important meeting lol. Well done, and wishing you all you could dream of as your career advances further. Thanks! Yes, holding what was firstly a collection of thoughts and then words that came out of my head whilst I sat on my sofa, is amazing. Wow, congratulations Claire! The cover is so gorgeous, must be an incredible feeling seeing your book in the world. This post was inspirational. I think it’s so important to keep a diary throughout your process, so glad to see you kept one, and shared some of it! Can’t wait to read it! The diary is actually reassuring now, as I try to write my second novel – reminding me how much of a struggle it was and how much doubt I had. How exciting!!! Congratulations. I dream the day I start querying. You inspired me to stop reading my emails and get back ti editing. Which I just learned I enjoy doing too. I hope your book is a big success. I’m very proud and happy for you. Good luck with the editing! It sounds like you might be reaching the end. Well done! Thanks. I hope to feel your jubilation one day. I’m sure it’s a good book your Friday Fictioneers are good. I have pre-ordered the hardback! Thanks Hilary, that’s very kind of you. How wonderful for you! Congratulations. I will keep a sharp lookout for your novel and, by purchasing one, do my part for the next chapter in your exciting story. I love the title and cannot wait to have a copy in my hands. Wow! This is such an amazing inspiring post. Best wishes to you and your book when it comes out. Now that I’m caught up, I must ask: Did you have to pay your agent up front? This is a big concern of mine as I have found several scam artists in the States that want money up front, and I’m beginning to wonder if I am just old fashioned in thinking the agents should get paid for getting a book published rather than for taking on clients. Once again, congratulations on the book. I confess that I’m not much of a reader these days, but I’ve put your book on my Christmas list. It looks to be the sort of thing that would hold my attention. No I didn’t have to pay my agent any fees upfront, and I think I would steer clear of any who asked for any money. The way it should work (with the agent taking a percentage of any advance or royalties) seems very fair to me. The agent invests a lot of time upfront in helping to prepare the manuscript for submission to editors, and it is only without being paid up front that demonstrates that they believe the novel has the potential to be sold to publishers. If agents are paid in advance of any sale, then they are likely to take on many novels, some of which are likely to be more difficult to sell. Then when they pitch these to publishing houses, the agent’s reputation for being able to select a good novel is likely to decrease, so that even if they take on an amazing novel, the likelihood of it selling has diminished because of the agent’s reputation. Thanks again for reading and for putting Our Endless Numbered Days on your Christmas list, but do bear in mind it isn’t published until early March in the US. Don’t ever tell me a secret…or at least not one about me! I had read this a while ago, Claire, but re-read it again this morning… so inspiring! I get so easily discouraged about my writing, and then I read this and realize that it truly is a long road– that has the potential for working out! Man, what a long, long time from start to publication! Again, I’m not a patient person… or maybe I am, but it’s hard to imagine. Whatever. Mazel!! Talk about LIGHT at the end of a long tunnel! Such exciting times ahead for you, Claire. That’s great news. You can’t help but be excited! They got back to me very quickly, but it is different for everyone, and also the Frankfurt Book Fair is just about to start so all agents will be very busy. Let me know how you get on. Fingers crossed! How quickly did they get back to you after you sent the full manuscript?